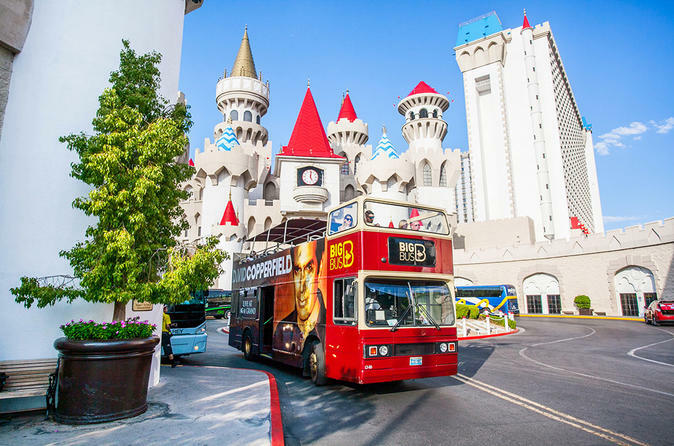 With 2 routes and sightseeing stops at hotels, restaurants, entertainment, shopping, cafes, and the many spectacular Las Vegas shows, the Hop-on Hop-off Double-Decker Bus Tour makes it easy to see some of the most exciting Las Vegas attractions. For one or two consecutive days, hop on and off the bus as much as you'd like! Board the bus at one of the stops and hop off at any attraction. Stay for as long as you please and continue your tour when you are ready. The live guided tours are a fun and informative way to hear about the casinos, attractions, points of interest and landmarks in Las Vegas. Choose from the Classic ticket to experience breath-taking views of the Las Vegas Strip and Downtown from atop of our London style double decker bus! Entertaining and informative guides on every bus share stories that have made Las Vegas one of the most visited vacation destinations in the world. Explore the city at your own pace; hop off at any one of our 15+ stops to shop, eat, visit attractions and rejoin when you are ready. Upgrade to the Deluxe ticket to include admission to CSI experience at MGM or the Deluxe ticket include the museum and admission to the Eiffel Tower Observation Deck (4pm to 7pm) for the 3-Day Hop-on Hop-off option and Night Tour ticket. Special Offer - Price displayed includes a 10% discount off the local price! Discount applies to Classic, Premium and Deluxe ticket options. - Book Now!